After receiving submissions from activist musicians from all around the world, the jury has decided to select three winners of FAIR PLAY Anti-Corruption Youth Voices 2016. 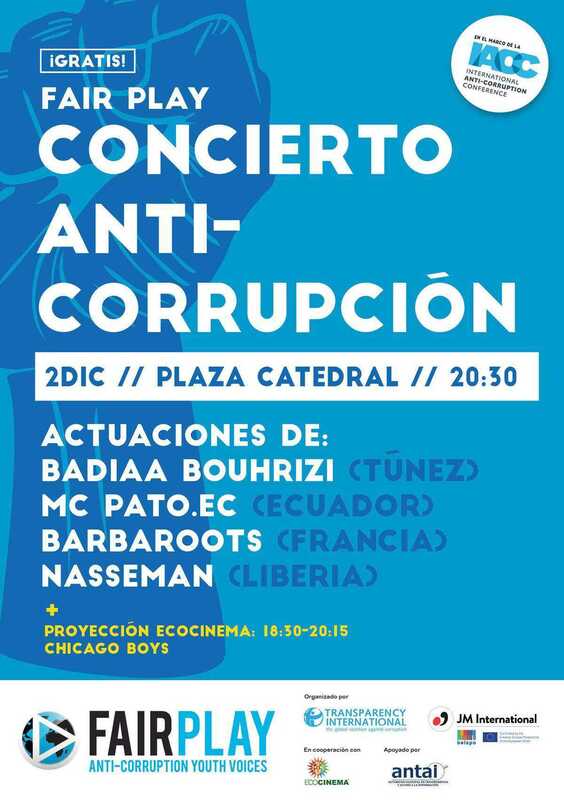 NASSEMAN from Liberia, BARBAROOTS from France and MC PATO. EC from Ecuador participated at the 17th International Anti-Corruption Conference in Panama from the 1st to the 4th of December, making their voices heard at the most important anti-corruption event in the world. The concert, held on Friday the 2nd of December at the Plaza Catedral (Casco Antiguo) in the old town of Panama, was liven up also by the special participation from Fair Play Ambassador Badiaa Bouhrizi. FAIR PLAY Anti-Corruption Youth Voices 2016 will return in 2018!